There is a new mid top Curry One dropping next week, and I think many will like these. Black on Black is a favorite amongst hoopers, and when you throw in a hit of gold. Well… now the kicks are straight fire. 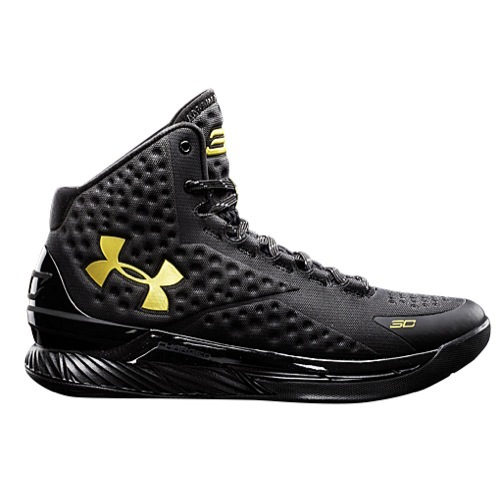 Nothing much to say about the Under Armour Curry One in Black/ Gold other than they’re a great pair of hoop shoes for a reasonable price. If you wanted to grab a pair then be ready on August 12. The UA brand store in Chicago has pair of these in a display case. I forgot to grab a pic while I was there the other day. These look great in person! Will these cost the same as the ordinary one? I would get these but I just got a pair of the low ‘home’ cw. If there’s a word beyond fire, these are it and I’m not even a guy that likes yellow gold anything. White gold and solver are all I wear and I would absolutely cop these.